The International Peace Gardens offer unique urban tranquility. It's 3.30 p.m. on a partly cloudy Wednesday and I'm sitting in the shade of a pine tree, on a green knoll, in a park on Salt Lake City's west side. For effect, I'd like to say that there's no one around—the absence of voices and general lack of commotion makes it seem so—but, in truth, there are a few other people enjoying this place on a mid-afternoon. A father walks by, his child held high in an external-frame backpack. Two old men, bald and stooped by age, shuffle across the semi-smooth cement on their way to rest on a nearby bench. A man rides his belongings-filled grocery cart like a scooter, kicking and gliding it, clattering over broken asphalt. We are all here on this day—me and the old men, the young fathers, the wanderers—in this public space unlike any other found in this city, or most other places in the United States (except North Dakota). We are at the International Peace Gardens in Jordan Park. City parks, by and large, are understood public spaces, made for all kinds of socializing—picnicking, pick-up soccer matches, first dates. They are places where crowds should be expected. They are places where noise is an assumed quantity. Increasingly, here in Salt Lake City, with its ever-growing population, parks are places so crowded that, as is the case at Liberty Park, Saturday afternoon parking becomes a premium, and cars take up space on the bike and pedestrian walkways. But so much of this does not apply to the International Peace Gardens. Located along the banks of the Jordan River, at 900 West and 1000 South, the 11-acre garden stands somewhat unique in the city as a place of silence and introspection. The garden was first imagined in 1939 by Mrs. Otto (Ruey) Wiesley, the citizenship chair of the Salt Lake Council of Women, who planned to open it for the 1947 centennial celebration of Salt Lake City's founding. The Second World War delayed Mrs. Wiesley's project until 1952, when she finally saw the completion and dedication of the Peace Gardens. 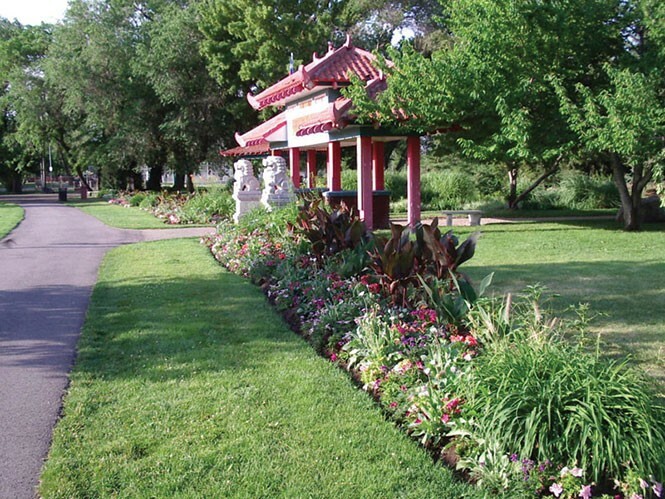 The Chinese garden, one of the first dedicated in the park, is just inside the main gate entrance. Fireworks accompanied the 1953 ribbon-cutting ceremony (some sources put the official dedication in 1959). It was a grand piece of landscaping in its day, whose walkways, it was written, "are well dotted with bamboo, lotuses and water lilies, weeping willows, mulberries, flowering plums and peaches. Here also are rare imported magnolia trees ... long an emblem of peace in China." These days, the garden appears a little worse for wear. Some of the grander pieces of statuary and architecture have succumbed to fire and neglect. In various corners of the garden, plaques are conspicuously missing. In the Japanese garden, cobwebs top somewhat imperfectly pruned shrubbery, which I presume that would never occur at a garden in Japan. But none of these hints of shabbiness seem to alter the space as it was intended. It remains a place of silent reflection, a place of unity and peace. Though there are 28 different countries represented at the International Peace Gardens—Brazil, Philippines, Mexico, Wales, Ireland, Korea, Africa, Russia, Vietnam, Canada, France, Tonga, India, China, Scotland, Greece, England, Holland, Switzerland, Norway, Sweden, Denmark, Finland, Italy, Lebanon, Germany, China, United States—there are no borders. Without fences, gates or other barriers, only pathways to suggest a person's movement, visitors are able to wander freely and at will from one magical space to another—from the Olmec sculpture in the Mexico Garden to the towering replica of the Matterhorn in the Switzerland Garden. There is, to tell the truth, one fence: a piece of chain link that lines sections of the exterior boundary of the garden. It separates the Peace Gardens from the Jordan Park, with which it shares space. On the outside of the chain link are "normal" park amenities, including pavilions with barbeque pits, a soccer field and a skate park. There are also children shouting, families picnicking, dads coaching. All good things. But inside the Peace Gardens, an old man is walking, hands held behind him, thinking. A young couple is sitting, whispering. And I am looking at a cherry tree in bloom and, in the silence, contemplating the beauty of the world.